Edible ArrangementsTariq Farid turned a single flower shop selling creative fruit baskets into a $US600 million global business. 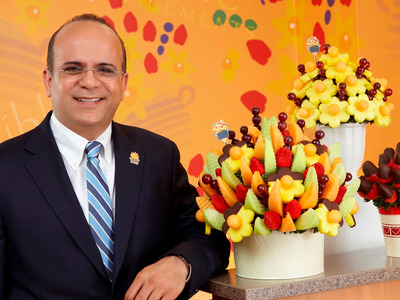 Tariq Farid is the founder and CEO of Edible Arrangements. 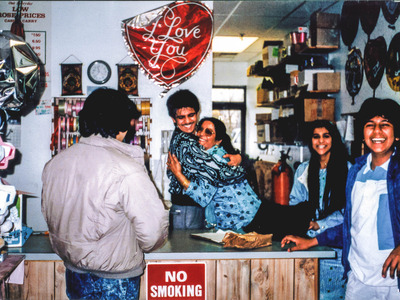 He immigrated to Connecticut from Pakistan in the 1980s, and opened his first flower shop with borrowed money at 17. He doubled down on fruit arrangements in 1999, and now Edible Arrangements is an international company with expected revenue this year of $US600 million. Farid explained the benefits and challenges of being an immigrant, and how it’s shaped him. 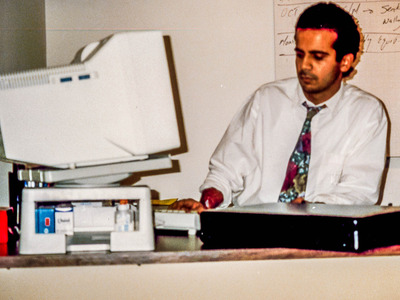 Tariq Farid was only 13 when his family moved from Pakistan to Connecticut. He started working at a flower shop to make money. And at 17, he opened his own. Farid is the founder and CEO of Edible Arrangements. He cornered a market that no one knew even existed: baskets of fruits carved to look like giant flower bouquets. Today, his business has 900 franchises across nine countries, bringing in more than half a billion dollars in sales each year. It hasn’t all been easy. He’s had to contend with everything from disgruntled franchisees to conspiracy theories and racist online trolling. But his unwavering optimism has pushed him through struggles from the very beginning. Tariq Farid: No one thought it would be successful. The way I did it was that I made some arrangements and started to send them out to come customers of ours in the flower business, and they would call back and say, “This is great. When can I order one?” And then I went and ran to a bank and I said, “Look, I got this great idea. I sent it to customers and they want to buy multiple of them, and they want to know when to send it. I just need $US120,000 to open a store.” And I got denied. They looked at it and said no one really does this, and the ones who did do it were struggling with it. And so we just bootstrapped it, just started it on the side of our flower shop with about a 600-square-foot location. We laid the tiles ourselves, bought the counters ourselves, did everything we could. And on the first holiday, three days before Easter, 28 orders came in. Back then we didn’t have a process on how to do it. We used to do everything manually. Took us all day, but it was an amazing hit. Twenty-eight doesn’t sound like a lot, but when you just start and you don’t have much of a budget, it was really cool. Richard Feloni: How many are you cranking out now? How big has the company gotten? Farid: We’ll do about $US600 million this year, and we have over 1,200 stores. Feloni: It’s a franchise model. Feloni: How did you know how to get that working? I know that someone had to explain to you what a franchise even was, right? What happened was we had a tiny little store and a person came to Connecticut to visit his mum and he saw the arrangement at the house. And he walked into the store and he said, “Hey, I want to buy a franchise. Are you franchising?” I hadn’t even thought about franchising, so I said, “Of course we’re going to franchise! Where do you want to do it?” And he said Boston. And because that was a customer walking in, and I always believe that you give the customer what they want, we did it. And that’s the secret to success, is that you always look at things from the customer’s point of view. That was my first franchise customer. I went into the Yellow Pages and found someone who knew how to franchise and he guided me through it, and we registered our first franchise and started selling franchises about a year later. Feloni: You started this when you were 30, but you started your first business when you were 17? Farid: Yeah, started my first flower shop when I was 17. I didn’t know much about business. If I knew a lot, I probably wouldn’t have done it! So I was really dumb about what would happen. You just kind of dive in and you figure it out along the way. Courtesy of Tariq FaridThe Farid family in the ’80s. Feloni: You came over here as a kid from Pakistan, right? Farid: That’s right. A-13 year-old kid with his family, and came from a very poor family. 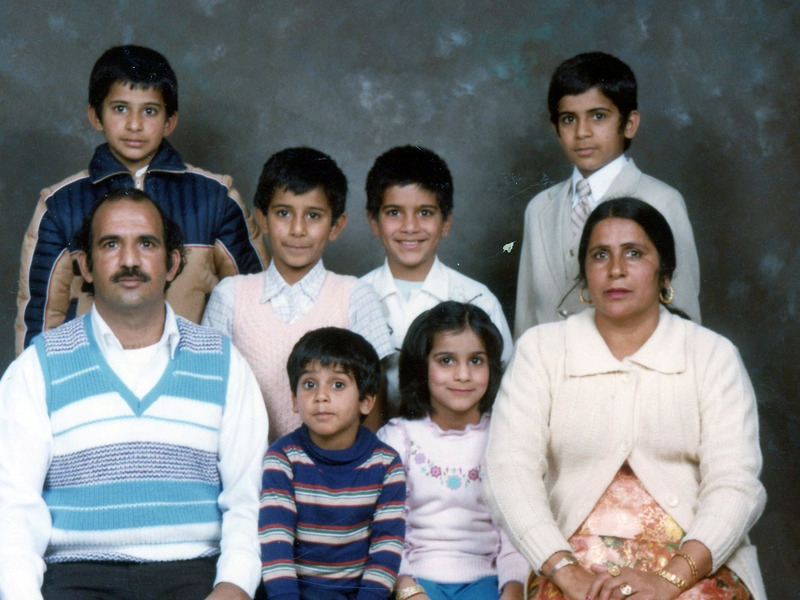 We ended up getting lucky that my father was able to get a visa because my uncle came here. My father worked as a machinist and I remember he was getting about $US8 an hour, and then he was working at McDonald’s as his part-time job, and then he would work on the weekends at Burger King. So franchising was always in the family. Everybody helped. I would shovel snow, cut grass, rake leaves, and everything. Then I got a paper route. I would help people put flowers in their car, ring things up, make some bouquets, and clean up the shop, and that’s where I learned the flower business when I was 13. And at 17, I opened my first flower shop. Feloni: Did you have an entrepreneurial spirit? Farid: I think I got my entrepreneurial bug from Charlie Farricielli. And I saw this man in action, where for him customers were everything and a lot of times it was just survival. You’re a small business owner and you do whatever needs to be done. So that’s where I got the first bug of entrepreneurship. And I didn’t know it was called entrepreneurship. I thought I was just opening up a flower shop. It just snowballed from there. Whenever an opportunity came, we would take it. When a second flower shop needed to be opened, we just opened it. We figured out how to do it against all odds. Feloni: What was the experience like going from Pakistan to a new life in Connecticut? What was that like as a family, and for you personally? Farid: When you’re a 12 or 13-year-old, you’re not really thinking. You’re thinking you’re going somewhere. Wherever you are, it doesn’t matter how poor you are, and that’s life. Feloni: As you were building the Edible Arrangements business, how did you figure out a way to make what may have seemed like a novelty concept that could work in a small, boutique setting, and turn it into a huge, sustainable business? Farid: I worked at the flower shop between 13 and 15. Back then, if you really did good in school you could get a piece of paper that told you you could get a job, and I used that to get work at Burger King. And at Burger King I learned about branding. What I saw was that everything was systematic. And the day I turned 16, I got a job at McDonald’s, because I always wanted to work there. The concept for me, even when I was working at the flower shop at 13, was that it was all about the customer. And the other thing is branding. Even when we had our flower shop I made a logo – I tried to act as a brand. But when we did Edible, that’s when all those years of experience gave me the opportunity to create a real brand. We spent the first six or seven months creating a logo, and I was lucky enough that I had worked with someone whose brother was a designer, and he designed our logo. The logo is the same one today, and I think I got for $US1,100. It was designed by a person who probably would charge hundreds of thousands of dollars these days! And so I think it’s the brand. But I never dreamed that I would have 600 stores. I think there was an Inc. article in 2001 and I said, “We’ll have 35 locations, but 35 perfect locations, really executed right, in five years.” And in those five years, we opened 500 as we were trying to do the perfect 35. The dream wasn’t really big, that we were going to open thousands of these. But when you can do one, or two, or 10 right, then it’s easy to replicate as long as you’re taking care of every process. The thing about Edible is not only does it have to taste great, but it has to look amazing. It has to be delivered on time. You have to handle the logistics of it so that a customer experience is what makes them keep coming back. Courtesy of Tariq FaridThe new world of the internet ramped up Farid’s ambition. Feloni: When did you make that shift from, “Let’s just have 35 locations,” to wanting hundreds? Farid: I felt that there wasn’t a challenge or boundary, especially as the internet came around, with what technology allowed you to do. And 1999, 2000 was like this magical time where anybody that was in technology was now using it to bring products to customers through the web. I saw this opportunity and point of sale was becoming easier. Before that, creating networks and all those things was really expensive. If you wanted to have 10 or 15 locations, connecting them required very complex and expensive systems. Now it wasn’t. For me, the “aha” moment came as we were building those first five or 10 locations and people started coming to us from California. People would tell me, “Do you really want to go to California? You should really grow out within Connecticut and maybe New York or New Jersey.” And I told them it’s a five-hour flight but we’re connected with them all the time through the internet, and that I don’t think it’s a challenge anymore. So people came to us. People came to us from Dubai and said, “Hey, can we open there?” I said, “Sure!” And within the States, we were able to hire more people as more franchisees joined. That’s how you expand. Because once we planted the flag in California, that’s when other people in there came to us, and then the stores just kept growing. Feloni: When you’re saying that you always wanted to have each of these locations be perfect, what happens now when you’re scaling? How are you able to keep that in mind, and what were some of the challenges that arose there? Farid: There are always challenges. I think in any business, people are the ones that make it or break it. So I think first it’s getting the right people. People ask me, “Why didn’t you do corporate stores? Why did you franchise?” Number one, I couldn’t get the money to do corporate stores. It was very debt-intensive and everything. But a person comes in and says, “Hey, I like what you’re doing and I want to do that in Waltham, Connecticut,” or, “I want to do that in New Jersey,” and we always felt that they’re just like us. We’re small business owners and we know the neighbourhood we’re in. We know what the challenges are. Franchisees have to have that same passion and that’s what happened. In our concept, it was really selecting the right people who kept making us grow. My passion has always been for small business owners because I think they’re magical. They not only are working in that neighbourhood, but they’re living in that neighbourhood. They’re looking to make their community better and because they’re part of that community. And that was the secret to our success, that we always looked for that right person and then they would, of course, hire the right people. I always hoped that they would do it like the way Charlie did it. As a-13 year-old, we would jump through hoops for this guy because he was just an amazing guy who worked harder than anyone, he loved his customers, and he had a successful business. I think that’s what we have. We have very connected franchisees in our community. Feloni: And with any scaled success, there would be bumps along the way. Feloni: In 2010, 170 franchisees filed a lawsuit because they were unhappy with the way that you changed the new terms of service. What happened there? Farid: I feel that every five years, a person has to do what I would call a “soft boot,” and every 10 years you have to do a “hard boot.” You have to really look at your concept and you have to really change it around. In 2008, we were coming up to our first 10-year anniversary and we were doing well, and I felt that we had to look internally and change. The world was changing. The iPhone and all these things that were happening that were connecting the customer – it was moving a lot faster than it used to move. So with that, we started to push some initiatives out there that didn’t make people happy. And it’s difficult to get along in a family, let alone a franchise concept, so of course you’re going to have disagreements. 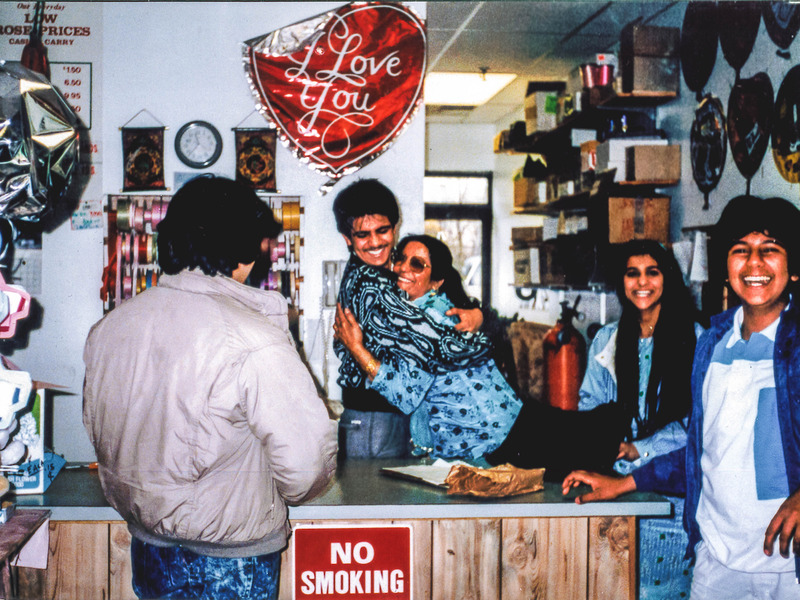 We had close to 900 stores at that time, so we had a certain number of franchisees that had issues and we worked through them. We’re going through that change one more time. We’re in the middle of our next 10 years. It’s gone by so quickly where now we have to evolve again. All around us, it’s the world of Amazon now. It’s not only digital, but lucky for us that people are going more towards natural products and fruit, so we are now launching a smoothie concept. We’re putting yogurt in smoothies because we have fruit, and that same fruit can be used to make juice bars and all these things. So there’s a business opportunity and it’s another hard boot. Feloni: Were there lessons from the first hard reboot that you’re going to take to this upcoming second one to make it go a little easier? Farid: I don’t think change is ever easy. I can sit here and say, “Oh yeah, it will be easy.” Change is never easy, be it in your personal life or in business. And it’s even harder in business because my partners in franchising are 900 entrepreneurs. They’re 900 people just like me. The best part of franchising is that if you can convince these 900 franchisees of something, you’ll move mountains. And at the same time, convincing them takes a lot because these are 900 different personalities. That’s what makes them successful. So with that, it’s never going to be easy, but it has to happen. We have to keep changing. Feloni: Were there communication lessons, maybe, that you learned from the first time, where you can bring the franchisees in easier to your plan? Farid: Of course. I think the first thing is you have to be clear about where you’re going. That doesn’t mean you won’t be misunderstood. I used to always say that you have to think five years ahead of where you are, and that’s my job, the job of a CEO or franchisor. When our franchisees have just finished implementing a change, I’m already thinking of something new to do, and then I start to communicate that. This whole smoothie concept and what we’re calling Edible-To-Go, this discussion has been going on for five, six years, and now we’re finally starting to do it. It takes a while, so you have to first have that soft communication, and you have to communicate often. What’s worked really well for me is you have to make yourself available. Every one of my franchisees has to have my number on speed dial so they can call me and just go over things. Feloni: Any franchisee throughout the world could contact you? Farid: Of course. They’re my customers, they’re my partners – of course. And not every conversation goes good, but that’s how it’s supposed to be. Feloni: And do you think that you maybe didn’t communicate as well as you could have in the first reboot, but that it seems clearer now that you need to give them more leeway with it? Farid: Well, no. Anyone that starts a business, and anyone in franchising, you will never get it perfect. You won’t get 100% of the people. So when they’re talking about 175 franchisees, that’s out of almost a thousand stores. So you’re always going to have that risk and when you want to change, you’re going to risk that there’s going to be some people who are going to disagree. But you don’t stop, especially when you know that it’s beneficial in the long run and you need to do it. I hope it never happens again, but at the same time it’s part of business. Feloni: In 2013, you established your foundation and were very active in philanthropy. Then in 2014, there were allegations of money going to Hamas from the foundation. You tried to ignore it, but you actually had to release a public statement on that. What happened there? Farid: I think there’ll always be groups of people, especially when you have this element of Islamophobia, and they look at people and judge people by their colour or their origin or something of that sort. There’ll always be someone who says something either without checking in with you or trying to get some validation. We were giving money to organisations within the States and these are organisations that other brands were giving money to, as well. Giving back to the community is a very, very important thing in my family, especially in a country that gave us so much. And when these things came up, even the Anti-Defamation League came out with a statement that said that none of these things is true. I’ve faced these kind of remarks and discriminatory things before. But when you measure that to the success you’ve gotten on the other side, it’s insignificant. But at the same time, you have to address them. You have to make sure you take them on, and you tell people everything is transparent, that everything is right in front of you. You can’t just accuse someone of something. And not only was none of that true, but I was willing to address any of those accusations with anyone who made them. Feloni: You said you’ve faced that type of thing before. Farid: I don’t think it’s been as much being an American Muslim as much as it’s been being a minority sometimes. As a minority, when we came here in the beginning, I don’t address it because there were maybe 99% of the people who had open arms and were amazing. I mean, there were the Charlie Farriciellis who were helping you to succeed, so it would be disingenuous of me to spend a lot of time on all of this discrimination. No, I’ve been blessed with so much, you’re supposed to share in that, especially when others have shared their time and their wealth and their resources. And I am built by many people who gave their time and gave their resources, and encouraged me, so I think that part has only gotten stronger, this desire to do a lot more to do in giving back and everything. When I was young, I faced some of these things, but it’s nothing compared to the success that I’ve gotten. It’s been an amazing journey. Feloni: So you see it as a distraction? Farid: I think it’s no different than a bump in the road. I think you can’t let it get to you. Just imagine being an immigrant who, one, parents can’t afford to dress them well because they’re poor, and second, you wear the wrong sneakers and you’re not the hip person, your English isn’t that good, and you’re intimidated. And then you come to this country where things are so much more sophisticated than where you grew up. I mean, we grew up on a farm, so we didn’t have anything. We didn’t have a car. My grandmother’s house didn’t even have electricity. My mother used to share stories that she got her first pair of shoes when she was seven years old, and on a rainy day she wouldn’t wear them. She would go barefoot because she didn’t want her shoes to get dirty. So when you come from that background, a lot of these things are insignificant. Courtesy of Tariq FaridFarid and family members in his original flower shop. And when you face a lot of these things, you also see there’s so much more to do. And you don’t get intimidated by it – you don’t turn around and stop doing stuff. Feloni: So you double down on it then? My mother used to say, “You have to leave the world a better place. You have to do your part. As you go, you have to leave a legacy behind. If not for other people, at least for your children.” She left an amazing legacy for us, and I have to do better. Feloni: Were your parents able to see you reach your level of success? Farid: My mother wasn’t able to. My mother passed away in 2005. She was my first employee when I did the flower shop, and I would leave her at the shop in the morning and I would go to high school. She would watch the shop, and for the first two years my mother was the true superhero in our family and she did everything. She passed away just when the company started to take off, and so she was never really – for someone who was instrumental in the success of her kids, and we came here because she was following her grandfather’s dream of coming here, she wasn’t really able to see it. But I’m sure she’s looking down, smiling at what she was able to help us do. Feloni: Did you incorporate more of your family into your business as well? Farid: My daughter has just joined. She’s a brilliant young lady, so hopefully she’ll be running it one day. Feloni: How old is she? Farid: She’s 24. It’s an amazing feeling when your next generation comes in and they’re more passionate than you at saying, “OK, I want to do this, I want to do that. I want to take it to the next level.” And she’s as smart as her grandmother. She’s brilliant and doing an amazing job. Feloni: Do you want to keep this a family company? Farid: I would like my family to be involved. I think I will do my part, pass the baton, and see what they want to do. My philosophy is that you always give businesses to your children. I hope that now it’s in the family DNA, this whole entrepreneurship and businesses thing. My daughter’s a lot smarter than me and I think she will probably take it to whole new heights. Feloni: Did you ever feel that when you encountered a challenge in the business that you had to reassert your leadership among your team to get them back on track or not be distracted? Farid: You have to lead. I’m a very hands-on CEO and owner of the company. I haven’t stopped working any less than what I used to do before. And for me, I’ve always said opportunity is what you chase and risk is what you mitigate. So when you look at it, you don’t get defined by the 1% or 2% of the issues. You get defined by the 98% of the success. It’s the people that are saying they’re loving it and the experience they have. And when you see opportunity, you just jump in and you figure it out. I did this a long time ago when we had no money, when we couldn’t get a loan, when most people told me it won’t work because we cut fruit, put it on sticks, and put it in a basket? How’s that going to work? We were doing this from scratch. That’s when it was really difficult. Now it’s not difficult. It’s not about asserting things- you have to jump in first and you have to guide where guidance is needed. I spend a lot of time learning these days because this next generation is brilliant. Feloni: The satirical website The Onion said Edible Arrangements defies capitalism, because how can you keep selling fruit arranged like flowers all over the world, constantly? On a serious note, how do you keep a demand going? It’s not easy. There’s a lot of work involved. We’ve spent millions of dollars in the last 20 years building a brand. Every one of those products has to be executed properly. And I’ll tell you what The Onion can learn from this: When you have someone who leaves their job and says I want to open a franchise, and takes their life savings and goes and opens a store on Main Street in a town in the US, that’s a force to contend with. That is magical. Because they’re going to work very hard to protect it, and they’re going to take care of every customer. The magic was with us when I opened my first flower shop with $US6,000 borrowed from my father’s boss, and it was in a place that had gone out of business. But being that underdog, wanting to just make sure it works, it worked. We are 900 owners that have put their life savings into this and we’re going to make this successful. And people will give me credit. People will look at it like, “You started this.” But no, it’s 900 people that started this. Feloni: Something that’s been key to you that we talked a bit before is this idea of the American Dream. And there are plenty of people who are pessimistic in the country now, saying that the American Dream can’t exist. What would you say to that? What would you say to an immigrant entrepreneur who is trying to make it? Farid: A lot of these immigrants are coming from very little means, so I think for them just being here, there’s the start of the American Dream, of being able to provide for their family. I’m proof that if you want to work hard, you want to work smart, you want to turn around and take care of your customer, you want to do it the right way, that it’s alive and well, and it’s been alive and well. And I’ve heard this many times. I mean, I’ve been in business since I was 17 years old, and along the way in the late ’80s I heard it. People would say that the American Dream may not be there or it’s dead. But we were doing well. We had three shops and we were opening our fourth one. Feloni: The pessimism’s nothing new. Farid: I think there’s a certain amount that is. If you want to focus on pessimism, if people want to focus on negativity, then you get negativity and you only stay within negativity. But if you want to focus on what you can do not only to better yourself but to better your community and to better the people around you, then you will do that. Feloni: Well, thank you very much, Tariq. Farid: My pleasure. Thank you for having me.